Keep ball to score ball must be played straight though one touch to score. 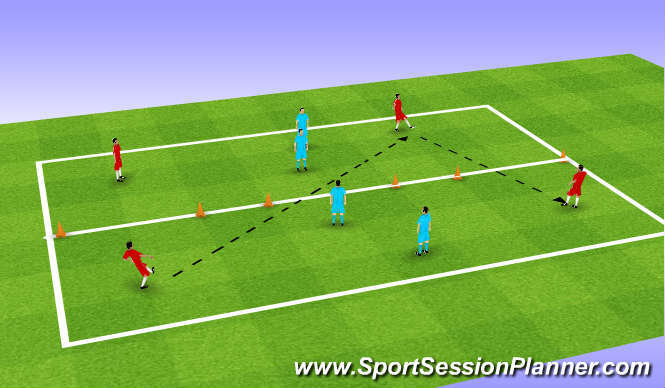 2v2 in square two outside players. Keep ball 2v2 ball must be transfered from one area to the other through one of the three goals. create space ball man arrives. Back to back goals toscore one touch one finish. Quality of passing. control vision movement. tackling and interseption. 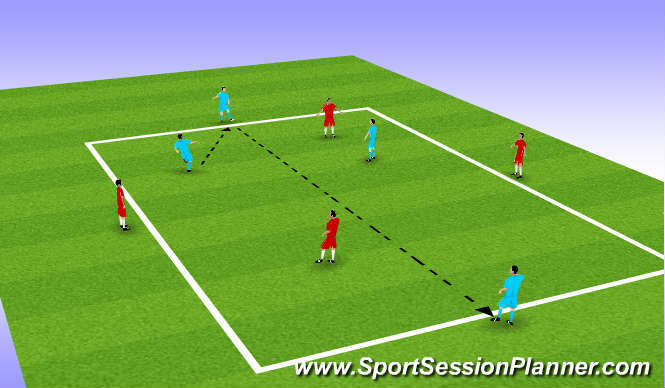 Creation and use of space in moving the ball through from defence into midfield at attack. Speed endurance, anerobic work. balance, timing co ordination. Communication, lending the ball to create space will inmess to close down and work when not in possesion. First two sessions were a good standard. passing was to a high standard. hard work 2v2 in large area so lots of rest period were needed. took some understanding the back to back game how to create space and timing of runs.